A cooling trend heading towards the July 4th holiday! Another hot, dry week is in the books, but some relief is in sight as we look ahead to the end of June and early July! Looking at the last several days of temperatures in Memphis, one might think it was early August with highs in the mid to upper 90s and lows in the upper 70s to near 80. Heat indices above 105 have again been common the past couple of days after a slightly less humid start to last week. 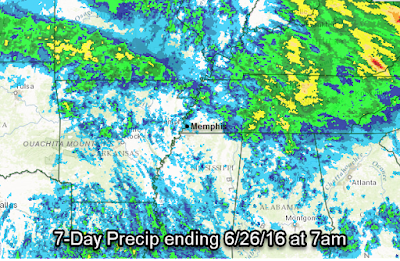 Barely any rain has occurred in the past week for most in the metro either. Almost no precipitation has fallen in the past week over a large part of the Mid-South. 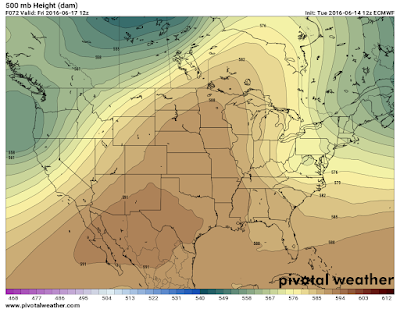 As we move into the last days of June though, an unseasonable cold frontal passage is set to occur on Monday with a reinforcing front on Tuesday. 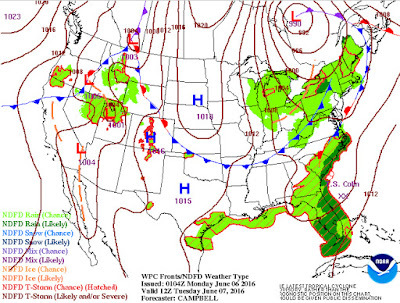 A strong area of continental high pressure building to our north from the Plains to the Ohio Valley will push these fronts south, resulting in scattered showers and thunderstorms, mainly during the day Monday. No severe weather is currently expected on Monday from any potential storms. With increased clouds and more widespread (and much needed) rainfall, temperatures will only top out near 90 on Monday. However dewpoints (a measure of humidity in the atmosphere) will remain in the mid 70s, so it stays sticky for one more day. Forecast rainfall amounts from the NWS for Sunday night through Monday. Most areas in the metro will likely see a quarter-inch of rain with some areas seeing a half inch and higher amounts from any thunderstorms. By Tuesday, the first front is south of us, pushing rain to our south, and a northeast breeze will be welcome as dewpoints drop into the mid 60s as the second front moves through. That will make it feel a little more comfortable. Temperatures in the June sun will still reach the lower 90s, or very near average for this time of year. That trend continues Wednesday with similar conditions expected. With dewpoints in the 60s, morning lows will be more tolerable - near 70 in most locations versus the 80 degree readings we've seen early the past several mornings. 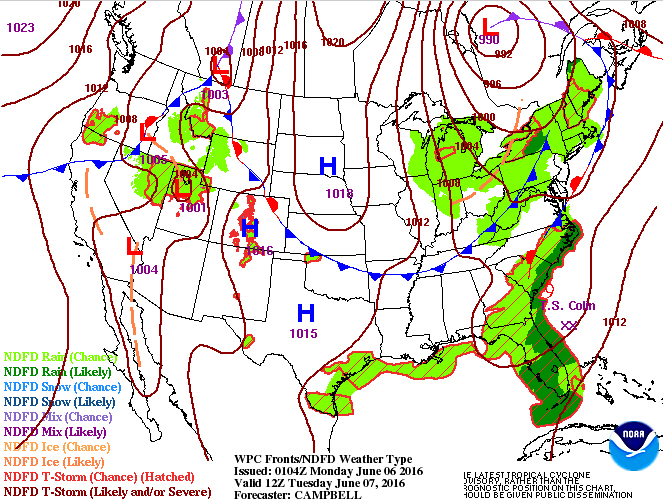 The surface map for Tuesday morning indicates that one cold front will be to our south while a reinforcing front, with lower humidity behind it, will be moving into the area. Despite green shading over the metro, rain chances are slim on Tuesday. 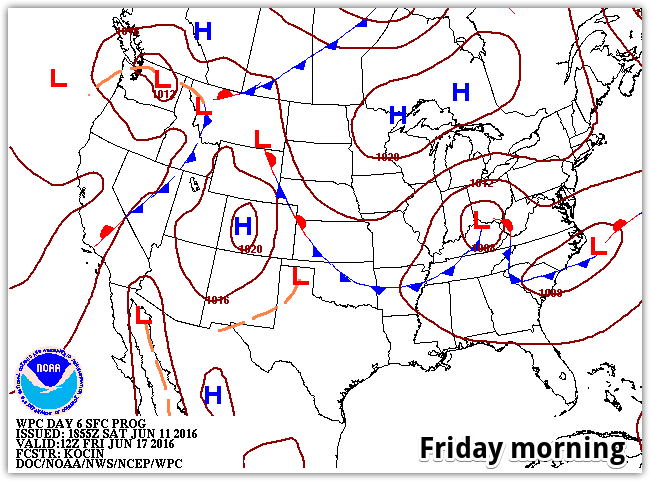 By late in the week, another front approaches the area as yet another high pressure system builds in to our north and the early week fronts lift back towards the region from the Gulf states. We'll be wedged between these systems, resulting in increasing rain chances heading towards the holiday weekend. The good news is that additional clouds will keep temperatures near or slightly below normal for next weekend's Independence Day celebrations despite increasing humidity. Now we just have to hope that Mother Nature doesn't display her fireworks instead of our man-made ones! Looking beyond the 4th, the long-range outlooks from the NWS Climate Prediction Center indicate a slightly elevated chance that average temperatures remain below normal for the first full week of July from the Ohio Valley and Mid-Atlantic into the Mid-South - a welcome change from a June that has been much warmer than average for most of the nation! Let's hope it pans out! The NWS Climate Prediction Center believes temperatures could average below normal for areas in blue between July 4-10, while areas of the western and far southern U.S. will see above normal temperatures. Slow-moving afternoon thunderstorms were the focus over the past few days, even as heat and humidity started to build across the region. Until today, daily high temperatures for 3-4 days had been in the mid 90s with increasing humidity since the weekend. (Average high temperatures this time of year are near 90°.) Afternoon thunderstorms helped to cool things off, if not reduce humidity levels, for the past couple of days. Today, morning cloud cover and scattered showers that started (and ended) earlier than the past couple of days managed to keep highs in the upper 80s. 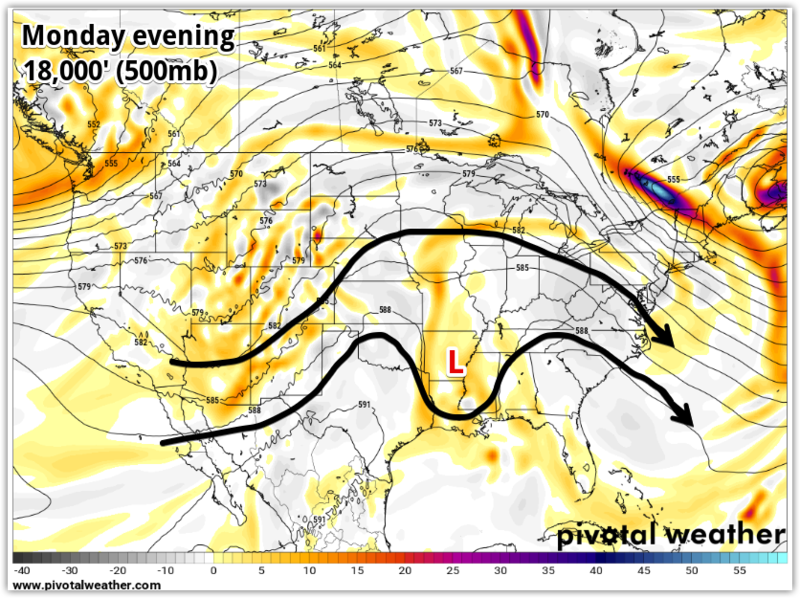 However, as we head into the next few days, an upper level ridge of high pressure that we wrote about in a weekend blog post will get stronger over the region, putting a damper on rain chances and allowing temperatures to climb once again. 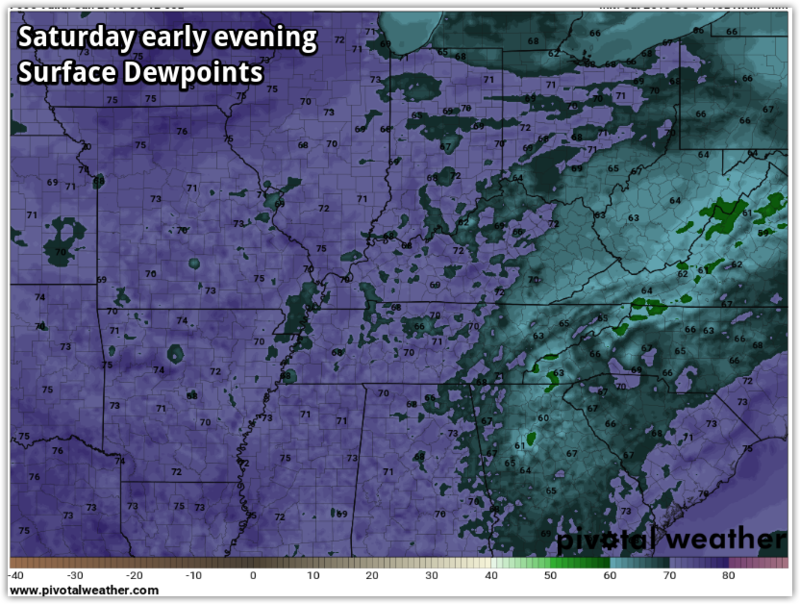 The bad news is that the humidity, as measured by the dewpoint, that rose the past couple of days will remain in place. That means we'll be dealing with dangerous heat index readings the next few days as the warmest and muggiest air of this early summer arrives. A massive ridge of high pressure at the upper levels (the "hill" depicted in shades of brown) builds across the central U.S. as we head through the week. The European model valid on Friday morning is shown above. Graphic courtesy Pivotal Weather. Only slight chances of rain are expected each day through the end of the week as high temperatures climb into the mid to upper 90s. With dewpoints in the mid 70s, heat index values will rise above the danger level of 105°, getting as high as 110° on Thursday in some areas. In addition, the high dewpoints will mean very warm temperatures overnight, with little relief as air conditioners continue to hum all night. 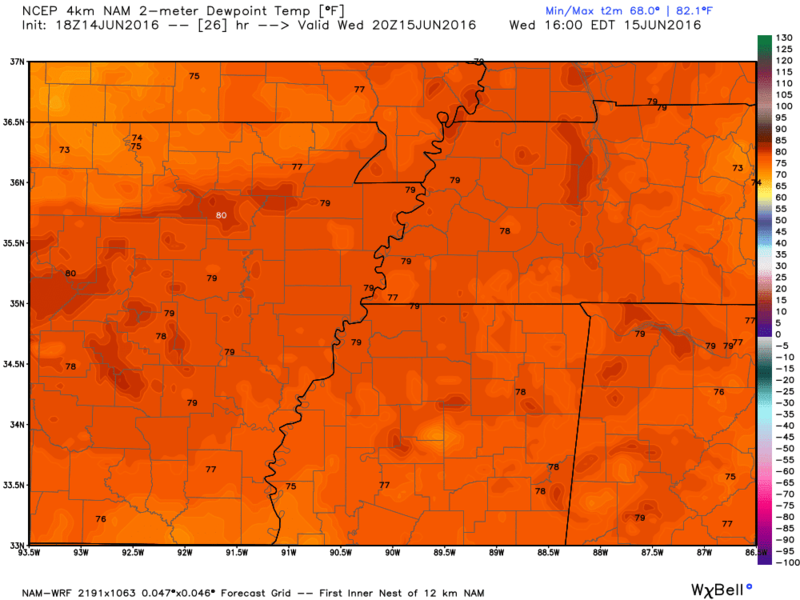 The high-res North American Model (NAM) depicts dewpoints for Wednesday afternon in the mid to upper 70s throughout the Mid-South. 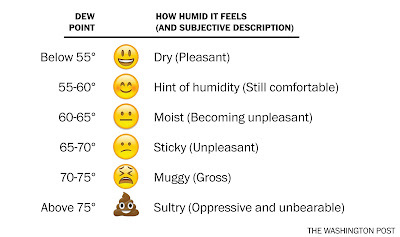 These values make the air feel uncomfortably humid and limit a person's ability to cool through evaporation of sweat due to high water content in the air. Graphic courtesy WxBell. 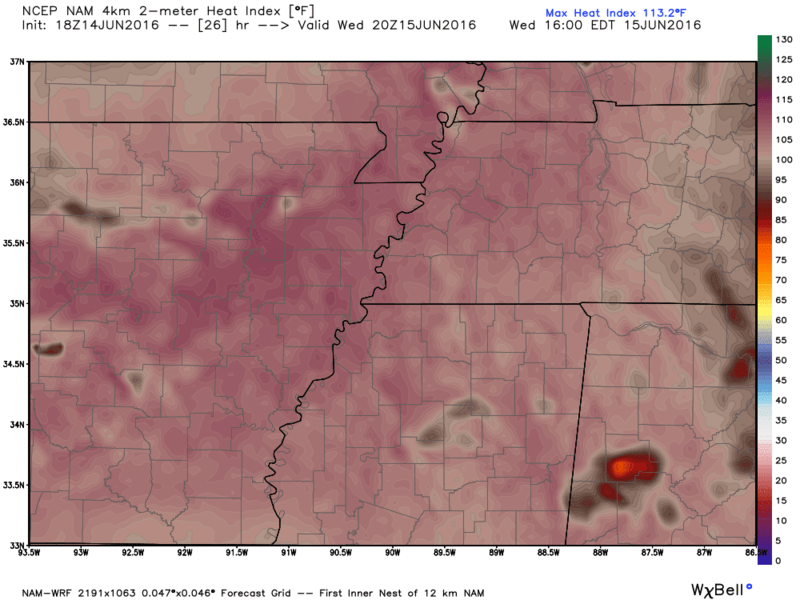 The high-resolution North American Model (NAM) depicts heat indices for Wednesday at 3pm in the 105° range (pinks) for much of the Mid-South, thanks to temperatures in the mid 90s and high dewpoints as shown above. Graphic courtesy WxBell. 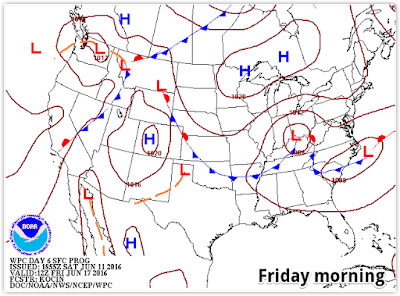 By early Friday, a "backdoor" cold front will slip through the metro, bringing another small chance of thunderstorms. (It is termed a "backdoor" front since it will actually move through the area from northeast to southwest versus the more typical west or northwest to southeast. And like your back door neighbor, it probably won't knock before just coming in.) The best news from the passage of this front will be a reduction in humidity levels heading into the weekend. At this point, it doesn't appear that it will have much effect on temperatures (maybe 3-5° cooler this weekend), so expect highs in the 90s to continue, though heat indices will be back down below the danger level. 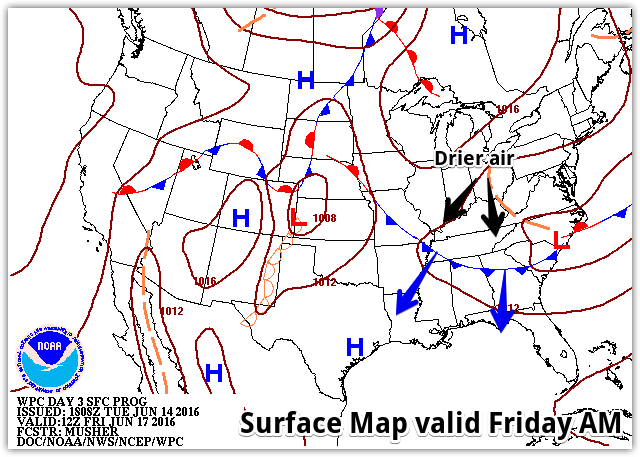 The National Weather Service surface map for Friday morning shows the backdoor cold front arriving from the northeast with drier, though not much cooler, air behind it. The European model shows even stronger high pressure aloft by the middle of next week (compare to first graphic above), which encompasses all but the northeastern U.S. 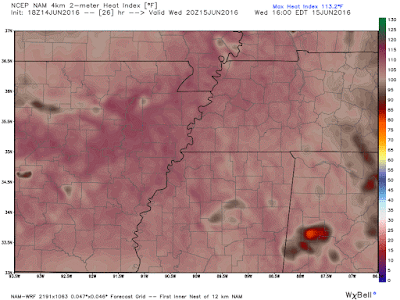 Temperatures in the Mid-South will be well into the 90s each day next week with a possibility of threatening the century mark, Graphic courtesy Pivotal Weather. As you all know, heat exposure, particularly over a prolonged period when there is little relief at night due to high humidity, can have detrimental effects on the body and the effects compound as a heat wave lengthens. 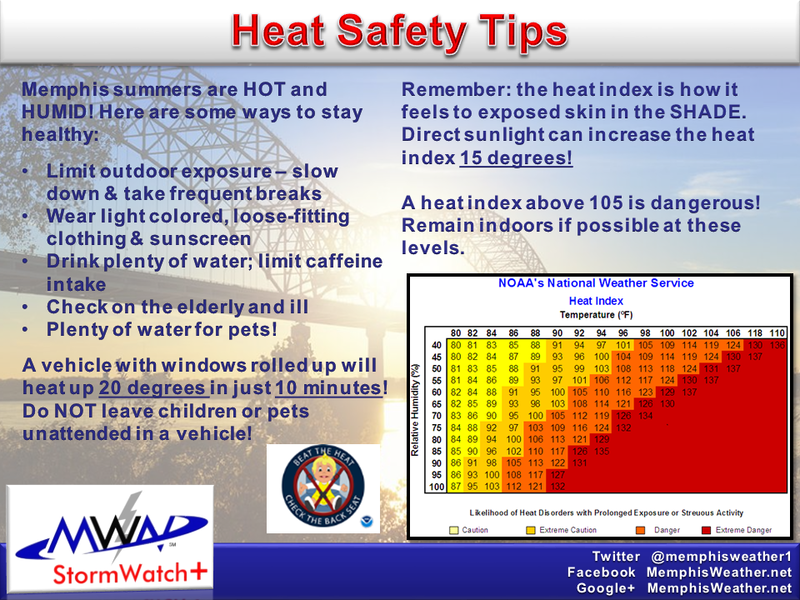 See the safety tips below as a reminder of how to deal with the heat and be sure to check on those who may need help finding relief, including our older generations, the very young, and our pets! Temperatures averaged below normal in May by just a bit, with just a couple of days reaching 90 degrees and the mid-month period marked by very cool weather with a few days remaining in the 60s. Precipitation was near average for one of the wetter months of the year, although some areas received much more rain as thunderstorms dropped very heavy rain in localized areas, prompting Flash Flood Warnings on the 1st, 25th, and 26th for parts of the metro. Severe Thunderstorm Warnings were also issued for the metro on the 25th and 26th with minor wind damage each day. For the period of "meteorological spring" - March, April, May - temperatures averaged 64.6 degrees (1.7 degrees above normal) while precipitation totaled 27.24", or 11.33" above normal, making spring 2016 the 4th wettest on record. Year to date, the average temperature for Memphis is 1.5 degrees above normal. Comments: Three days recorded highs at or above 90 degrees in May. Four days saw low temperatures of 70 degrees as late spring humidity increased by the end of the month. Comments: Three days recorded more than 1"of rain. A dry (finally!) 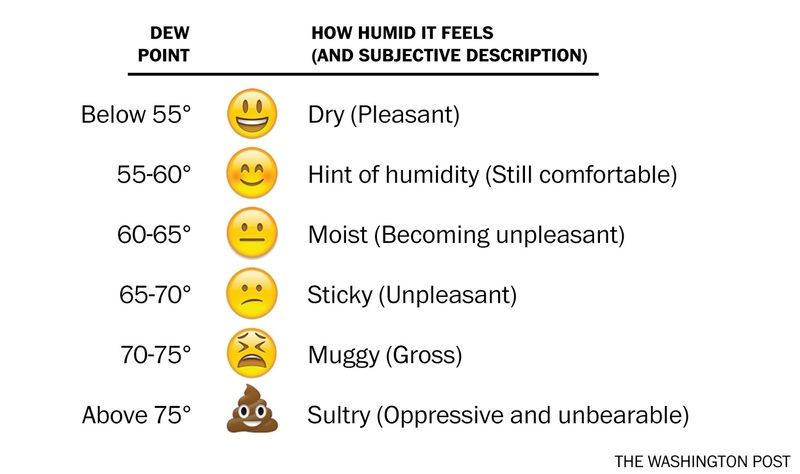 and less humid (yeah!) yet still warm week is unfortunately in the rearview mirror. We now turn our attention to a hot, humid summer-like weather pattern ahead. OK, it may not be THAT bad! 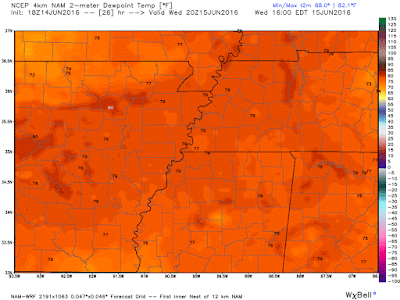 Today (Saturday) was a transition day as humidity increased (dewpoints reached the mid 60s to near 70), temperatures were the warmest yet this year (exceeding yesterday's "warmest" by a couple more degrees at 95), and a few summertime airmass showers popped up in north MS, which is a good indicator that moisture and instability is working its way north from the Gulf of Mexico. A dry continental airmass of Canadian origin dominated surface conditions the past week, but it has moved away with high pressure over the western Atlantic and southeast states now pulling warm moist Gulf air into the region on southerly wind. Meanwhile, at the upper levels a large, hot ridge of high pressure sits overhead. This combination has meant above normal temperatures and increasing humidity to start the weekend with a few afternoon showers forming to our south where moisture is a little more plentiful. 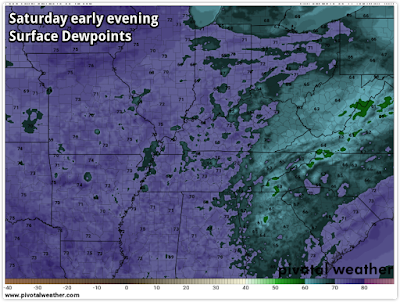 The North American Model (NAM) depiction of dewpoints at 7pm this evening, showing widespread values near 70 degrees across the region. 70 is generally the level where most people really start to notice it getting sticky. By Sunday, continuing southerly wind will increase dewpoints (a measure of humidity in the air) to the lower 70s, which is very "sticky" for most people. With increasing moisture and plenty of instability from above normal temperatures, expect more scattered afternoon and early evening shower and thunderstorm activity tomorrow and for it to extend further north into the metro. Higher rain chances should help keep temperatures down just a few degrees though. Rain showers will diminish in the evening with the setting sun. The Global Forecast Ssytem (GFS) model for Sunday evening shows a large ridge of high pressure dominating the central portion of the country. It is providing the above normal temperatures for the area "under" the ridge. By Monday and Tuesday, the upper levels change a bit as high pressure breaks down over our region as an upper level disturbance cuts into the ridge and moves across the Mid-South. With continuing abundance of very warm, unstable air and high humidity levels, scattered thunderstorms are again expected each day, primarily in the hottest part of the day. With the disturbance lingering, rain chances may be slower to diminish in the evening hours Monday and possibly Tuesday. 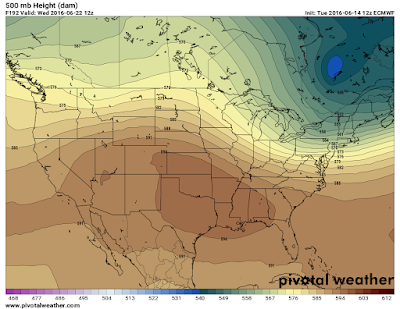 The upper level ridge begins to get a "ripple" in it by Monday as an upper level disturbance (yellow/orange shading) strengthens a bit resulting in a weak upper level low according to the GFS model. 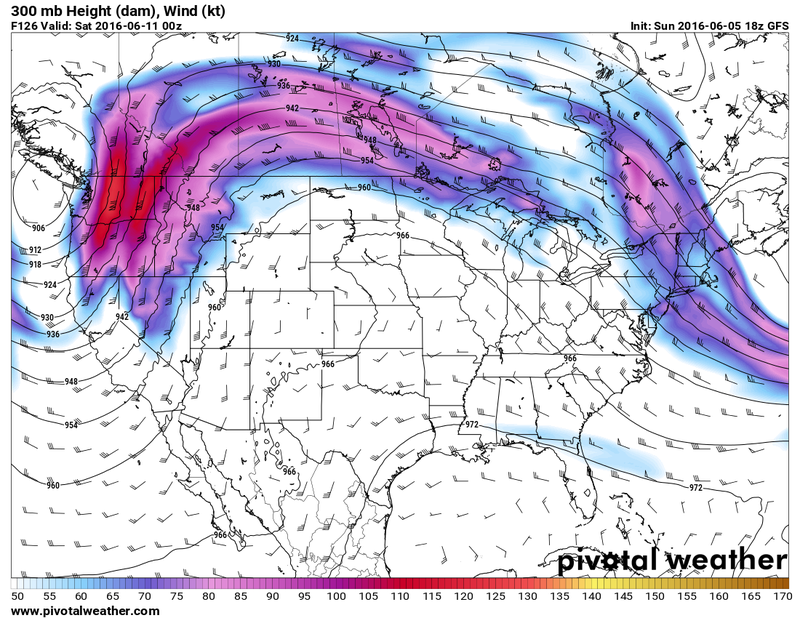 This will be the trigger for more widespread (though likely still scattered) convection early this week. It will take a couple days for the low to move east of us. With that disturbance moving out, another looks to move in on Wednesday, continuing the chances of scattered daytime thunderstorms. Heat and humidity will continue to be an issue as well though days with the higher rain chances should see heat indices remain below the 100° mark we see this weekend as temperatures remain in the lower 90s. As we head into the end of the week, it appears that weak low pressure drops in to our east with a cool front dropping south from the Ohio Valley into the Mid-South late Thursday or early Friday. As expected, that means more rain and thunderstorm chances, but also slightly cooler temperatures, especially by next weekend when highs should be back down in the mid 80s. Being that that is still a week away, and this is summer, that could all change. For now, be prepared for daily rain chances, humid conditions, and varying degrees of heat depending on cloud cover and coverage of thunderstorms each day. After the early week upper level energy departs, a weak cold front will drop south into the region by late this week, providing additional chances of showers and thunderstorms, but also temperatures that are closer to normal for next weekend. Graphic courtesy NOAA/NWS. Fortunately, the increase in clouds and scattered showers will also mean lower ozone levels prefer sunny, hot high pressure days. Those who have experienced breathing issues the past couple of days due to the Code Orange and Code Red conditions should "breath easier" as we head into the new week. 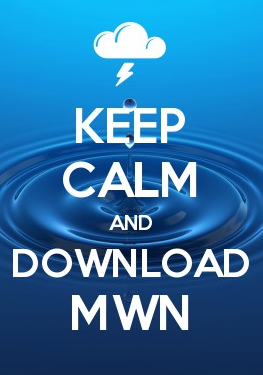 Click here for the complete detailed MWN Forecast and check back regularly this week as rain chances in particular could change from day to day! Finally, I want to take a moment to make a public thank you to one of #TeamMWN's longtime social media nowcasters. Patrick Luckett has been with MWN for nearly 4 years (!) and been a very reliable member of the team. He's stayed up late, gotten up early, and worked long hours to keep you all well-informed with his great updates on our social media accounts in good weather and bad. Patrick has accepted a full-time job this summer with the Department of Defense here in the Mid-South as he finishes up his schooling and prepares to become a "real meteorologist." :-) I know he'll do a great job wherever life takes him. You may see /PL fill in a couple of times here this summer, but his regular schedule with MWN is coming to a close. Please join me in wishing him well! And while I'm on the #TeamMWN topic, many regular followers know that William Churchill (/WC) served MWN for a good while as well and recently stepped aside as he begins a career with the National Weather Service. William will be getting married this summer and finishing his NWS internship then starting his career later in 2016. I also wish William and Kylie all the best and thank him, again, for his dedication to MWN the past few years! After a couple of weeks of active weather, the Mid-South is overdue for a tranquil pattern - and we're getting it this week! 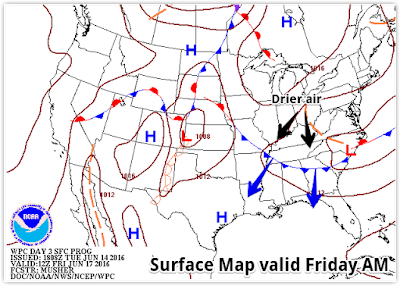 High pressure will keep the region dry with reduced humidity over the coming week. 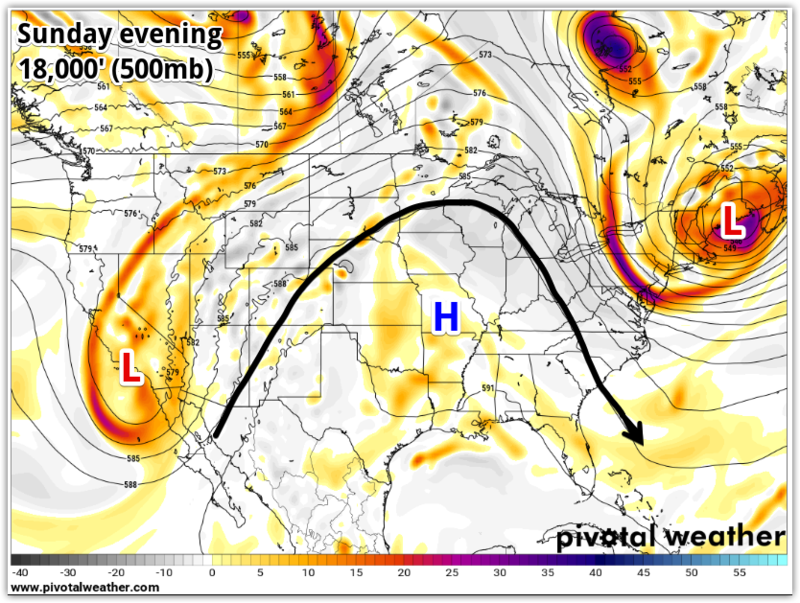 One weak high pressure system will influence the weather early this week, followed by a cold front on Tuesday that then ushers in stronger high pressure with origins in Canada. Temperatures will remain warm Monday under mostly sunny skies. Dewpoints near 60 will mean comfortable conditions despite temperatures in the upper 80s. The cold front moves through early Tuesday with maybe a few clouds and an increase in north wind, otherwise basically unnoticed. What we will notice however, is cooler morning lows (50s in some outlying areas on Wednesday morning) and a slight reduction in daytime highs for the mid-week period (mid 80s). The surface map Tuesday morning shows a cold front passing through the region with high pressure building in from Canada behind it. Much cooler weather is expected in the northern U.S., while we will enjoy lower humidity and a warm, sunny days. However by Thursday, that high pressure system slides to our east and takes root over the southeastern U.S., causing temperatures to rise again. In fact, a massive ridge of high pressure builds over the middle of the nation late in the week as well, reinforcing the warm air. The upper air pattern (at the jet stream level) for late week shows a very large and strong high pressure ridge dominating much of the U.S. This will reinforce above normal temperatures heading into the weekend. Our first string of 90s is expected to start Friday with dewpoints also beginning to rise a bit, making it feel more uncomfortable by next weekend. Heat indices will likely top 100° by Sunday as Gulf moisture increases, also sparking our first chances of afternoon thunderstorms in a week. Long-range trends indicate that above normal temperatures will likely continue into the middle of June. For a complete look at the upcoming week, see the MWN Forecast here or in our mobile app. High probabilities of above normal temperatures continue through June 11-15, according to the Climate Prediction Center. In the Mid-South, there is a 70% chance that temperatures will be above average for this period. Elsewhere, Tropical Storm Colin has formed in the southern Gulf of Mexico today, just off the Yucatan Peninsula, and is moving north. It will curve right tonight and head towards a landfall in the Big Bend area of Florida Monday night, then quickly move across northern Florida and parallel the Carolina coastline on Tuesday before heading out to sea Tuesday night. The forecast track for Tropical Storm Colin that will bring heavy rain, wind, and minor storm surge to Florida tomorrow. You might look at the calendar and see that it's still the first week of June and we are already on the letter C in storm names. Is this unusual? You bet. The first two storms, Alex and Bonnie, both formed "out of season" (Bonnie just barely, a week ago also affecting the Carolina coastline), which makes Colin the earliest "C" storm in the Atlantic since 1887. Does this mean an unusually active 2016 season? Not necessarily. The Hurricane Center predicts an average year, but that would be more active than the past couple of years that ended quieter than usual.